The remaining housemates have no other option other than to press on and keep playing their game as Biggie always advised them. With the final day quickly approaching, housemates have not denied us themselves, as much as they were visibly tired and worn out. The day started off with some exercise with Rosa and the last eight housemates started their day on an energised note. Some of the housemates have been getting creative with their stay in the house, pulling pranks and doing their best not to get caught. JJ and Nhlanhla were up to no good but no one took the prank badly. Housemates were also kept on their toes, with Biggie's task that required them to adopt other people's characters. Changing faces did not come easy and the Hotshots often forgot to stay in character yesterday. We hope that today will be better. 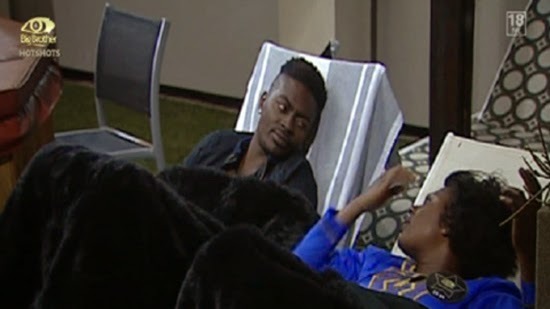 Idris and Tayo had a bit of a tiff and with all the talk of strategies going on in the house, we wondered if this was not a plan to throw Tayo off his game as many deemed him a formidable force in the house. Regardless of the drama, housemates continued as normal with "The Three Suckers" making sure that they had the time of their lives. The three boys have become inseparable in this last week. Tayo has been bonding with M'am Bea and has seemingly found her to be the best person to hang out with as they hardly argued. The rest of the housemates spent more time working on their wall. Today we look forward to another interesting day where the housemates will deck themselves out in seven colours to Africa! Tayo is indeed a formidable force!! God is on His side, including Africa... Pls lovely people lets kip voting him! All d very best T boy. Now I can see Mambea noted that Tayo is a winner now she try to associate herself with King Tayo. Poor Mambea leave our Broda alone. The Father of Akintoye don't worry. what ever the situation may be on sunday the lord is ur strength. i wish u best of luck in everything u do n d lord will strengthen u towards ur pure heart. ONE LUV NIGERIA ONE LUV AFRICA. Tayo has entertained us from day 1, He is the winner am Tayofied now!! Curious 3 know Tayo's highest level of education. wHO CARES WHETHER HE IS EDUCATED OR NOT AFTER ALL THIS IS A GAME AND HE IS PLAYING IT VERY WELL........TAYO IS/WILL BE THE ULTIMATED WINNER COME SUNDAY.......ARE YOU MAD OR SOMETHING........THEY MUST BE MAD!!!! The same was said of karen. Yes she wasn't as educated as others but she won because of her sincerity. Tayo may not be as educated as others but he has been very entertaining. He is very sincere too. He says things the way the are. He deserves that money if really this show is about entertainment. Pls Tayo's fans stop insulting Sheillah she doesn't deserve this. This is getting out of hand. And u expect us to vote for tayp I must be joking our votes goes straight to Nhla. Dear All, your contributions above shows how myopic in understanding character is. Did u guys read Tayo's profile? Fyi Tayo has Higher Normal Diploma (HND) in Marine Studies. Within the Oil and Gas business in Nigeria Sky is his limit. That apart guys, check his profile more on the net you will be marveled. He has an open heart. I think that should be the reason he is clamouring for HMs such as Permithias, Small Pepper, Frankie, Trezagah, Kacey Moore etc to work with. He has said that there is going to be another show after this show. Trez can't speak yet he was loved by so many, but remember English will not win d mola. also English will not make u pass maths,physics, chemistry etc.tayo for d mola Africa. Please stop the noise !!! Idris is going to be laughing all they way to the bank on Sunday! Noise isn't going to make you win! It's biggies game, and it's not your money! Biggie is the one determining who participate or not! And you are in for a big surprise come Sunday!! Nigeria ,Tanzania , South Africa and Zambia are behaving like small kids, your comments are not mature. Why not wait on Sunday and see. This year BBA is the most boring ever. The most boring housemates with no exceptions. ALL of them are dead meat. I don't understand why they are referred to as hotshots though. Cos none of them is a hotshot. Biggy you should have called the show just BBA season 9 that's all. I am trying to understand who is the hotshot in that house but no one comes to mind. Pls next year audition carefully we want real entertainment. This year housemates can't dance at all with the exception of Goitse and Nhlanhla. I miss people like Angelo Maria Dilish Selly Sulu Feza who can really dance no wonder Biffy hardly plays music. BBMzansi was far more entertaining than hotshots.